Our team at ForeFront Power started working with Superintendent Michael Coleman at Fairfax School District in 2015 to create a renewable energy project to meet the needs across two locations, Zephyr Lane Elementary School and Shirley Lane Elementary School. Given the availability of space at Zephyr Lane and the close proximity to the Shirley Lane campus across South Fairfax Road, our engineers were able to develop a single project solution to serve both locations. Like teachers and school administrators, our team at ForeFront Power has a passion for education and doing our best to make the future a better place for the next generation. ForeFront Power is proud to have the first approved community solar projects in both PG&E and SDG&E service territories in California. This new community solar program allows solar developers and customers to sign agreements to enroll to a portion of the output of a solar facility. In addition, you receive a credit on your utility bill for this solar energy. ForeFront Power is proud to have worked closely with Dixon Unified School District to realize their renewable energy and savings goals. Our team partnered with Dixon USD to conceptualize, design, develop, and finance 843 kilowatts (kW) of solar power across five locations. School Project for Utility Rate Reduction (SPURR) is a joint powers authority dedicated to helping California schools and colleges control and reduce utility expenses. Zero Net Energy (ZNE) is generating a lot of buzz around California, especially for schools and municipalities. So what is Zero Net Energy and does it make sense for your organization to pursue for existing or new buildings? ForeFront Power’s partnership with Paso Robles Joint Unified School District is a great example of our ability to maximize a customer’s energy savings along with their solar footprint. Our team worked with Paso Robles JUSD to conceptualize, design, develop, and finance solar power at six district schools, totaling 1.7 megawatts (MW). 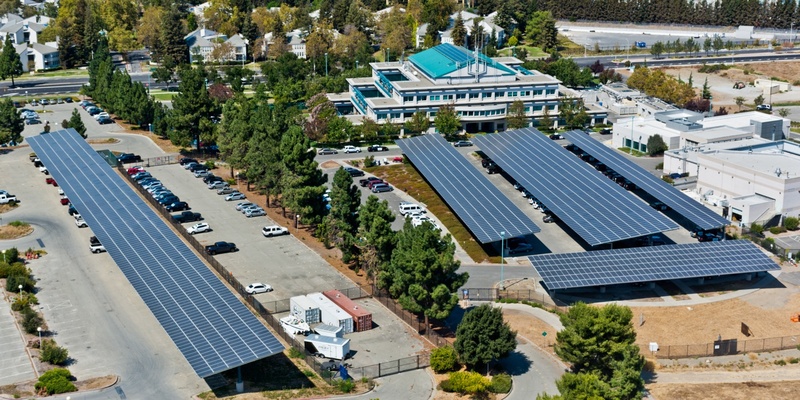 The portfolio maximized the District’s energy savings by utilizing carports that capitalize on available solar options like Net Energy Meter Aggregation (NEMA) and solar-friendly rate tariff, A-6. Moreover, the District was able to leverage a Power Purchase Agreement financing mechanism that offered the benefits of solar energy with no upfront cost. ForeFront Power prides itself on providing excellent service to school districts large and small across the United States. At Atascadero Unified School District in California, the ForeFront Power team developed two systems totaling 316 kilowatts (kW). Ready for Solar and Not Sure Where to Start? Here are the First Steps. It looks like you are interested in how solar power can save you money on your energy bills and help you green your organization. Great! The first step is to engage in a free consultation with one of our solar energy experts so that our team can generate a proposal that includes a conceptual design of the solar project as well as an estimate of the energy savings that you can anticipate. To get that process started, we need some information from you. This information helps us to develop an accurate proposal. A REC: Whats in a Name? A REC, also known as a Renewable Energy Credit (REC) is a tradable certificate that represents the environmental attributes of a certain quantity of renewable energy generation. Think of it as a deed of ownership that can be bought and sold among various entities. The ownership does not apply to the actual electricity generated, but to the carbon-free quality of that electricity. Sound abstract? We hope this post makes RECs a bit easier to understand.